With this strategic guide to building information modeling (BIM), you’ll learn how to implement this new technology as part of a comprehensive systems approach to the design, construction, management, operation, maintenance, and use of buildings. The authors, among the leading experts and pioneers in BIM, show you how BIM supports more streamlined, integrated, and efficient business processes throughout the life cycle of buildings, from their initial conception through their eventual retirement or reuse. The result is better quality buildings, lower construction and operating costs, shorter project turnaround times, and a higher quality of building information to support better business decisions. Moreover, they set forth a plan for incorporating BIM into every organization’s existing workflows, enabling you to take full advantage of all the benefits that BIM offers. Throughout the book, sample documents and figures help you better understand the principles of BIM and how it works in practice. In addition, first-hand accounts show you exactly how adopters of BIM have gained a competitive edge. Architects, engineers, constructors, building owners, and facility managers can turn to this book to realize the full potential of BIM and radically improve the way buildings are designed, built, operated, and maintained. Dana K. Smith, FAIA, is Executive Director of the buildingSMART alliance, a program of the National Institute of Build-ing Sciences (NIBS), and a Senior Analyst with Cyon Research. He is the founder and former chair of the NIBS Facility Information Council, developer of the U.S. National Computer Aided Design (CAD) Standard and the National Building Information Modeling (BIM) Standard. His efforts to advance the art and science of building have been recognized by numerous honors and accolades, including the 1996 Federal 100 Award, the 1997 NIBS Member Award, and the 2006 CAD Society Leadership Award. MICHAEL TARDIF, Assoc. AIA, CSI, Hon. SDA, is Director of Integrated Project Delivery Systems for Grunley Construction Company in Rockville, Maryland, and a contributing editor to AIArchitect and Construction Project Controls and BIM Report. He is the former director of the Center for Technology and Practice Management of the American Institute of Architects (AIA) and the former project manager of the agcXML Project, an initiative funded and executed by the Associated General Contractors of America (AGC) under the auspices of the buildingSMART alliance, one of the first standards-development efforts to support genuine e-commerce in the building industry. Chapter 1: Building Industry Challenges and Opportunities. Global Trends in Supply and Demand. Converting Inefficiency and Waste into Profit. Choosing the Right Tools, Deploying the Right Tool Suites. New Metrics for Real Property Valuation. 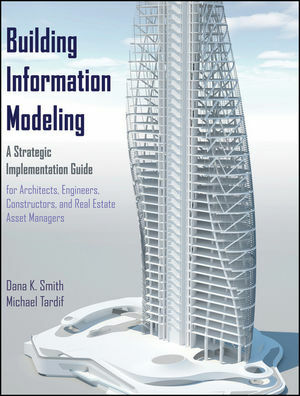 Chapter 2: BIM Implementation Strategies. Leaving the CAD Era Behind. A Systems Approach to BIM Implementation. Aligning a BIM Implementation Strategy with Technology Trends. Fostering a Culture of Information Stewardship. Using Technology to Build Trust and Mitigate Risk. Measuring Progress Toward Strategic Goals. Toward a New Business Paradigm. Chapter 3: Business Process Reform. Aligning Business Strategies with Industry Standards. Integrating Information Gathering into the Business Process. Business Process Modeling Case Study. Chapter 4: BIM-based Enterprise Workflow. Sidebar: Integrating Data Collection with Business Processes. Chapter 5: The Building Lifecycle. Lifecycle Views of Building Information. The Feasibility, Planning, and Development View. The Design and Construction View. The Operations and Maintenance View. The Ownership and Asset Management View. Chapter 6: Building Information Exchange Challenges. Sidebar: Data, Information, Knowledge, and Wisdom. Sidebar: Case Study: Information Management. Sidebar: The Wayback Machine: Archiving the Web. Information Transparency, Accessibility, and Security. Chapter 7: Building Information Exchange Requirements. Defining "Best Case" Business Processes. The Construction Operations Building Information Exchange. Chapter 8: The Way Forward. Workflow: From Sequential to Parallel Processing. New Business and Contractual Relationships.